I have the QVector cars that I want to filter basing on the car's registration number. I want to create a new filtered vector. I don't think that this is ok because i'm iterating 2 vectors, copying from the first one to the second one. Am I doing this right? This can be done neatly using a proxy filter model. Below is a self-contained example that runs on both Qt 4 and 5. Not the answer you're looking for? Browse other questions tagged c++ qt model-view or ask your own question. 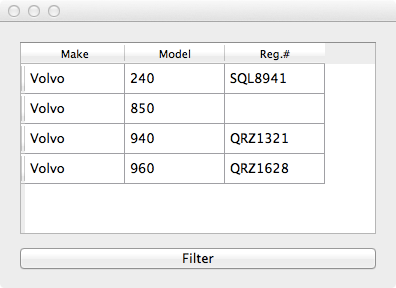 How to set width of QTableView columns by model? QTableView displays column headers, but no data?